Who Can Get to Your Medication? Opioids disappeared from my grandmother’s medicine cabinet, and we had no idea what happened to them. My grandparents are like many older people in America today; they want to live in their own home independently and for as long as possible. As part-time caregivers, we work hard to address issues such as limited mobility or chronic disease, trying to keep our loved ones safe in their home environment. There may be some things, however, that we don’t see as threats—things that we may view in the context of protecting them, but not see that they may be a harm to others. One of these safety hazards is medication. 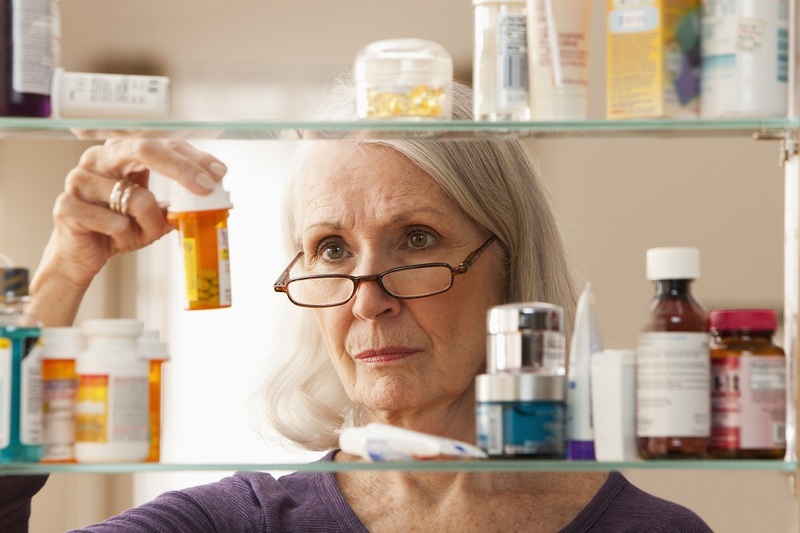 Seniors may often be on multiple medications at once and managing them can certainly be a challenge. While you may be asking the questions such as, “Is this an opioid?” or “Is this safe with the other medications being taken?” and making sure they take the appropriate dosage at the right time, there is one thing you might be forgetting. Consider taking some steps to keep these drugs away from others, including visitors like grandchildren, home health care workers and other service people. One day, while checking my grandmother’s prescription bottles to see if any refills were needed, I noticed an alarming number of opioid pills had disappeared. I quickly realized I had no way to know what happened. I could have miscounted. Grandma could have taken too many. The pills could have been stolen by another family member, the cleaning lady or a home health care worker. This situation is happening across the country. People hang onto their opioid prescriptions, keeping leftovers for a “rainy day.” Those prescription drugs can easily end up in the hands of someone who should not have them. The American Academy of Family Physicians suggests that opioids be stored inside a locked cabinet or at least in a safe place that can’t easily be accessed, intentionally or accidentally. Do not take opioids unless they are truly needed. When a doctor suggests an opioid prescription, ask if there are non-opioid alternatives you or your loved ones can try first. The National Safety Council offers free Warn Me labels for your insurance card that include advice on how to ask your doctor or pharmacist the right questions about opioids. Safely dispose of unused opioid medicines. Unwanted or unused pills, liquids or other medications should be disposed of appropriately. You can order a free, postage-paid prescription drug disposal envelope from the National Safety Council, or dispose of drugs at a safe disposal site in your community. Opioids should never be thrown in the garbage or flushed away. Lock up opioids. Medications should be stored out reach of children, and in a safe place—preferably locked—to prevent other family members and visitors from taking them. Purchase a medicine lock box at a local retailer, online or at your pharmacy. I work on eliminating preventable deaths from opioid overdoses every day, and I never imagined this crisis would hit so close to home. Be careful with opioids to protect yourself and your loved ones from the possibility of opioid misuse and overdose. At the National Safety Council, Jenny Burke leads strategic advocacy programs that raise awareness and educate audiences to help us all to keep each other safe. These initiatives include transportation safety, home and community safety, fatigue and prescription drug overdose.